Media is the most powerful instrument in communicating to the masses. As we belong to the age of communication, sharing and exchange of information becomes vital. Mass media are vehicles for the transfer of ideas, concepts information to both general and specific audiences. Media is called the forum for public or people’s assembly. It plays the role of bridge between general people and government in times of different national need. Media not only provide people with news, information and ideas but also raise various issues on socio-economic-political matters. They also form public opinions and consciousness in different problems and issues and influence the mindset of people regarding that existing issue, event or situation. The mass media are competent to facilitate short-term and long-term effects on audiences. Short-term purpose include exposing audience to creating awareness and knowledge; and enhancing audience thinking and help in changing their attitudes, behaviors, and perceptions of social norms. Long-term objectives include all of the aforesaid tasks, in addition to paying attention in reforming of apparent social norms, and maintenance of behavior change. Mass media performs three key functions: educating, helps in shaping public relations, and also advocating for a particular policy or point of view. So, we can state that Media not only communicate knowledge, but can be part of larger efforts to encourage and endorse actions having community efficacy. Mass media assist leaders in setting an agenda on policy, shaping the debates about contentious or controversial issues, and gaining support for particular perspective. Mass media play a significant role in today’s world of information and communication. It is up to us to draw advantage or disadvantage from media in order to appraise and judge the message of media. We need to be meticulous about dealing with mass media. Considering the far-reaching influence, the concerned authorities should use the media for the greater advantage of mankind. Hundreds of years ago, the idea that one could access all of the information the world has ever known with a device that could fit in pocket was unfathomable. With the invention of the internet, this idea began to become a reality as society made major strides in the advancement of communication technology. In recent years, the smartphone has reigned as the primary method for non-face-to-face communication due to its features of being portable and easily accessible, and was the first true device to be able to carry out this “unfathomable” feature of unlimited access to information. It seems like most people get a new cellphone every year– and while that’s good news for phone manufacturers and telecoms industry, it’s not helping our wallets or the environment. One negative consequence of the smartphone, however, are the amount of hazardous waste produced each year by the world’s booming population. This high volume of hazardous waste is contaminating the earth on an immense scale, and needs to be addressed in order to support a sustainable planet. Project Ara, a project headed by Google, addresses this problem by creating a modular system for smartphones in which only certain components of a smartphone need to be disposed of at a time, as opposed to disposing of an entire smartphone for one minor flaw. 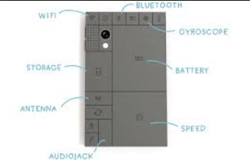 A Module Phone - “Modules are the building blocks of an Ara phone. They are the hardware analogue to software apps. These are physical components that implement various phone functions. There are two major classes of modules: Front modules, which make up the front of the phone and generally provide user interaction or interface affordances such as the display, speaker, microphone, etc., and rear modules, which provide the bulk of the phone’s back-end functionality. In addition to being able to customize the phone, users can mitigate hazardous waste by replacing only the components that are expired or undesirable, as opposed to disposing the entire smartphone. "Usually a phone is integrated into one solid block and if one part gets broken you have to throw away the entire phone,". "But this has different components, so if your battery is broken you can replace the battery or if you need a better camera you only upgrade the camera component. So you don't throw away the entire phone; you keep the good stuff." The whole idea is to generate lots of buzz, so companies see there's a huge market and realize that they really need to make a phone like this. Phonebloks will lead to fewer phones being thrown away, thereby reducing waste. Electronic devices are not designed to last. This makes electronic waste one of the fastest-growing waste streams in the world and our phone is one of the biggest causes. As technology tends to grow, managers face a lot of questions. Having a strong digital strategy in a highly competitive environment is an integral component to ride against the wave of digital disruption. But before we think about planning a strategy, it is important to understand the dynamics of why most startups/ businesses fail and why some win. The answer is - Connections. Innovation in products do matter, no doubt. But most importantly, the underlying connection between the products and its users or other products is the reason why they become successful and sustainable. A very good example of how “network effects” plays an important role in growth is looking at Whatsapp - An instant messaging platform. The reason why Whatsapp is successful, even though there are a lot of IM platforms in the market is because it benefits from the Network Effects. One prefers whatsapp because their friends use whatsapp and as the number of users grow, more users are willing to use this platform. Innovative businesses like Amazon have realised the potential of Network Effects and have shifted their focus from product creation/ manufacturing to providing a Platform to create a connection between the customers and suppliers. The main reason why most customers prefer Amazon for purchasing products online than other platforms is because customers get variety and choices from a large pool of suppliers. The same is with the suppliers because a large amount of traffic turns up on the Amazon platform. This network continues to grow. Again, the connections help the business benefit from the Network Effects. So many services online are for now for free such as - Google Docs. Yet, the businesses still make a lot of money. The answer is again - Connections. Creating a storage and file sharing platform, several products such as Google Docs, Sheets, Forms, Photos and others share the same Google cloud storage drive accessible under one single E-mail ID. This gave Google a competitive advantage and is the reason why customers using Google Drive are less likely to shift to other cloud storage platforms like Dropbox. And platforms benefit from the Network Effects. The reason of why Android platform has always been successful than Mac OS/IOS or other OS is simply because of the network effects. As customers chose the android platform, they drew developers to build more apps. And as the number of developers increased leading to the increase in the number of apps on the platform, it drew more and more customers to choose the android platform. Unlike Mac OS/ IOS or windows OS, Android provided more choices and varieties of apps to its users and the developers got the benefit of spreading the fixed costs associated with the app and reach a large number of customers. It benefitted both. Again, the Network Effects played an important role in growth, cost reduction and profits. The term “Digital Divide”, is a social issue referring to the differing amount of information between those who have access to the digital devices, internet along with other IT services and those who do not have access. The term became popular among concerned parties, such as scholars, policy makers, and advocacy groups, in the late 1990s. The major reasons for bridging the digital divide gaps are Social and Economic Equality, Social Mobility, Democracy and Economic Growth.to name the few(2). All these issues are somehow interlinked and point in the direction of need of Information Communication Technology (ICT) services through computer or mobile phone access with internet and communication applications for many services such as security, safety, health, crime control, emergency service, peoples career, civic life, social welfare services, public decision making processes, productivity improvisation etc. and many more. The under privileged sections of society having no access or less access requires the focus more. As the PM Mr. Narender Modi said in the NITI Aayog annual conference, held in Vigyan Bhawan, Delhi in September’2016, “we are in a world, where the “change” is constant and we are just “variables”, we must change for growth”. It is noticed that the growth is not required in major metros, but in the upcountry, as the person working on a project at this level is not aware of latest technology and doesn’t have appropriate resource knowledge to participate. Microsoft is working with device makers in India to make technology accessible to more people to help bridge the digital divide(1). Microsoft is working with 20 local partners, including Micromax and iBall, along with multi-national partners Lenovo and Acer to bring new form factors to the Indian market through affordably-priced devices. In this direction Microsoft is trying to work on devices that are able to access information that is stored in specific cards and smart chips issued by the government, and can be used in medical profession for health sector in India as used in Europe already. Micorosoft is working with their local partners to understand the unique requirement of the Indian market, where with biometrics, ID or scan elements can come together to create custom devices that will serve the specific needs of the country. In addition to Digital India workshops being organised in 120 universities, covering 2,400 colleges and 30,000 students, Infosys co-founder, Kris Gopalakrishnan, recently turned in an ambitious report on how to realise the Digital India programme. Google has also set a digital locomotive in motion by announcing plans to build on its initial success in creating WiFi hotspots around railway stations, in partnership with the telecom arm of Indian Railways. Mobile has the potential to drastically accelerate economic growth in India, as well as overcoming a range of social challenges, such as closing the digital divide and bringing financial inclusion to all segments of the population.To spread the awareness on the many companies multinational companies like GSMA are coming forward with conference “GSMA Mobile 360 Series – India”, representing the interests of mobile operators worldwide, uniting nearly 800 operators with almost 300 companies in the broader mobile ecosystem, including handset and device makers, software companies, equipment providers and internet companies, as well as organizations in adjacent industry sectors. It is one of the first steps towards highlighting Mobile as the Key Enabler for Development of India focusing on programs including Mobile Money, Connected Women, Digital Identity and Agriculture. The digital divides is persistent and still with us but many private sector companies, the educated sections of society and government are throwing the thrust for bridging the gap at all levels possible along with building a well informed and literate society. Since India’s heart lies in its villages, the rural sector is still left behind in terms of right resources and people to provide them with powers and channels to be part of latest communication system, so more efforts required for promotion of services at this level. The exploitation of the latest technologies and forward thinking approach of the government at this time presents both the opportunity and the security bridging this gap of digital divide, which will surely play a critical role in the country’s economic and social development along with giving industries of developing countries a competitive advantage. 1. Celis, Alvaro.Microsoft focussed on closing digital divide in India, says Global VP Alvaro Celis. [interv.] Danish Khan. september 23, 2016. 2. A Brief View to Digital Divide in Indian Scenario. Ipsita Panda, Durllav Charan Chhatar and Bulu Mharana. 2013, International Journal of Scientific and Research Publications, Volume 3, Issue 12, December 2013, pp. 1-7. 3. Iansiti , Marco and Richards, Gregory L. .Information Technology Ecosystem Health and Performance. Boston : Harvard Business School Working Knowledge , 2006. As the aid and development industry grows and expands, the degrees in ‘development studies’ have increased. Development Communication today has become a medium which mobilizes and educates the masses to make dynamic and intelligent contributions in development activities with utmost efforts. Development Communication is further defined in communication studies as a deliberate effort to improve control over resources and regulatory organizations. It normally includes educating masses about their socio-economic environment, building self-reliance based on solidarity support and sharing, involvement of people in discussions and decision making, inspiring people to gain an aptitude to handle conflicts and to build consensus. It has grown in popularity as a subject of study since the early 1990s, and has been most widely taught and researched in the third world and in countries with a colonial history, such as the UK, where development studies originated. Students of development studies often choose careers in Corporate Social Responsibility (CSR) bodies and research centers, international organizations such as the World Bank, United Nations, private sector development consultancy firms, and Non-Governmental Organizations (NGOs). In Development Communication, importance of communication in the field of development is duly emphasized. Within the framework of development communication, two trends have developed successively over the years: First an approach that favored large-scale actions and relied on the mass media, and Second approach that endorsed grassroots communication (also called community communication), promoting small-scale projects and relying heavily on media (slide presentation, posters, videos, radio etc.). Development communication is an extraordinarily broad field. It covers a extensive range of issues, from the conventional themes of health and public awareness, agriculture, to newer areas such as small and medium enterprises (SMEs), governance, youth, urban development, and so on. Communication uses a wide range of approaches, from "social marketing" (which emphasize on advertising and marketing to promote development goals) to participatory approaches that work with local people and help them communicate their opinions and needs to others. It includes advocacy and lobbying, highly targeted campaigns and mass marketing. Determining the right audience is a very important part of a successful communication intervention, as communication serves a variety of audiences: teachers, villagers, farmers, herders, prostitutes, students, policy makers, women, scientists, extension workers, unemployed youths, health workers, suicidal teenagers, ethnic minorities, small entrepreneurs, government officials, donors etc. Communication also employs many diverse types of media: such as television, radio and the press, emails and websites, interpersonal media such as face-to-face contact, training courses, meetings, posters, flyers and handouts. The question that now arises is what can you do with a degree in Developmental studies? Non-governmental organizations by organizing campaigns, lobbying, development education and raising funds. International development institutions such as the World Bank and the United Nations. Government policy: here you can work in the public service at all levels right from developing strategies and agenda concerning development and aid. Consultancy: You can work as a ‘consultant’ for diverse organizations on a variety of projects. Another option is that of securing scholarships, to enroll in the development studies courses offered in India as well as overseas. There are many scholarships that support development studies like the Commonwealth scholarships, Rhodes and British Chevening scholarship. Development and learning is an on going process, which influences all spheres of life. This never-ending process commences from the womb and continues till the grave.The scientific research indicates that the initial learning process begins even before we are born. It helps in designing our prenatal preferences, which we carry forward in our subsequent life to follow. As we continue to evolve, the environment around us becomes a decisive factor in designing our choices, personalities, likes – dislikes, etc. The same was suggested by psychologist Albert Bandura while explaining the 'cognitive process' of learning, which is influenced and designed by our surroundings. The progressive stride from pedagogy to and ragogy, further helps in the advancement in the journey of learning continues. One of the paramount rational behind learning and development is to improve the quality of lives, so that the coming generations can equip themselves with the ever changing challenges and demands emerging from the dynamic environment. The changing internal as well as external environments are exposed to many triggers which makes the process of developing and learning indispensible, and at times challenging. These triggers can be an endeavor to test existing knowledge, acquire advancement in knowledge, invention of new technology, birth of new concepts, the effect of a political decisions, change in market trends, increasing local or global competitions, individual's as well as organizational development prospects, finding solutions and understandings of human life and connected environments, at microscopic and macroscopic level etc. In the recent time, one of the themes which dominated media narratives and political discourses is the development of skills for the upcoming generations, to make them market as well as future ready. Last year, the ambitious project titled ‘Skill India Campaign’ was flagged by Prime Minister Narendra Modi along with the new National Policy for Skill Development and Entrepreneurship was implemented in 2015. Various organizations like the Ministry of Skill Development and Entrepreneurship, National Skill Development Corporation, National Skill Development Agency (NSDA) etc, have been pitched in to bring the desired result. The main objective behind these endeavors is to meet the ambitious skill target set in the 12th Five Year Plan and in the times to come. Nevertheless, one has to keep in mind, that imparting technical skills without imbibing the soft skills in the upcoming generations will be a task half done. To prepare the present generation for the future endeavor, technical skills/ hard skills along with the soft skills provide them perfect environment to grow, build and enhance their career prospects along with the personality development.Where on one hand, hard skills help the students/learners to acquire a desired job, the soft skills will assist them to enhance or sharpen their personal attributes like, communication (intra-internal-group-intercultural) skills, emotional intelligence quotient, social skills, thus helping them to retain the desired job and grow harmoniously in the given environment. Today, theoretical knowledge is not the final destination, but practical exposure along with the development of soft skills is the need of the hour, so that we can make the upcoming generations more balanced and an all rounded personalities. In order to empower our future generations, the need of the hour is to expose them to more soft skills like; enhancing communication persona, understanding the various dimensions of personalities, equipping students to deliberate and discuss, social etiquettes, public speaking skills, team building, and appreciating emotional intelligence. To conclude, in words of Mahatma Gandhi, "only through imparting education through crafts can India stand before the world. "[ii]And in todays' context soft skills are those crafts, which will give strength and stability to every stride taken by the present as well as future generations to come. Information technology (IT) is the study, design, development, implementation, support or management of computer-based information systems, particularly software applications, computer hardware and mobile devices. IT deals with the use of electronic computers and computer software to convert, store, protect, process, transmit, and securely retrieve information. Many companies now have IT departments for managing the computers, networks, and other technical areas of their business. Since we live in the “information age” where IT has become a part of our everyday lives, which is giving great impact on our society. It is also important in our daily lives. The lack of information at the right time will result in low productivity, low quality research works, and waste of time to pursue information and even to do research which actually others had done or in other countries. For example, we can read latest news using the online newspaper.The use of IT helps in teaching and learning, by enhancing the effectiveness of learning, or by adding a dimension to learning that was not previously available. IT may also help in student’s learning, and also support in student’s engagement with collaborative learning. Information technology brings out the production and development of mobile phones in the market such as iPhone, iPad which are more technologically motivated. It has released the doors open to which is profitably channelized through the use of cellular phones. In addition, reaching out people is more convenient and accessible where everyone can use its application with comfort. Connecting with each other is made easy with the flooding entry of communication device available today. There have been tremendous changes in the ways people live, work and play over the past three decades. The past ten years or so have seen changes at a much faster pace. Technological innovation and entrepreneurship have been the key players in promoting these changes. The rapid pace at which IT is changing means five to ten years from now lifestyles will be a lot different from what they are today. Nowadays we have some very good products both in the hardware industry and in the application industry. Companies like, Facebook, google and twitter have completely revolutionized how people communicate and share information. In the device world we have big industries like Microsoft, apple and Samsung that are paving the way for the future generation by introducing revolutionary devices and applications. IT has also made the buying and selling of good so flexible. With the use of e-payment systems, users can also purchase anything from online. With the use of e-banking, moving of money has become so simple. Even with the invention of Visa Electron has also made it simpler to move with more money. We can buy anything with a Visa Electron card. Marketing has undergone a metaphasis during the past decade. Markets and consumers are changing. Today markets are both online and offline. Online markets are flourishing because of many factors like convenience to the consumers as everything is a click away; better prices as the number of intermediaries are less and the benefits are passed on to the consumers; geographical barriers have been overcome as anyone living in any part of the country can order online; a large variety of products are available; assurance of quality products makes it easy to shop; further ease of payments like cash on delivery are attracting those customers who are apprehensive of credit card payments and fraud online; return policy makes it flexible to exchange or return the product if it does not satisfy the customer. Besides these online markets the offline markets are also changing as more and more retail formats are coming into the country. In short the organised retail business is increasing in size. The consumer behaviour is also changing. Consumers are becoming more brand conscious, but at the same they are also value conscious. We have the largest youth population in the world. Along with it a large middle class. Youth are more susceptible to technological changes and their adaption cycle is faster. As a consequence, companies are foreseeing a new class of consumers who are not traditional buyers. They are open to buying anything online as long as it suits their pocket, is trendy and appeals to them. The traditional culture of saving consumer to indulging consumer is a new phenomenon. Further services are available online like buying movie tickets to booking a holiday. In view of the above scenario, marketers are using social media as an effective medium of advertising rather than the traditional newspaper or television advertisements. They are trying to connect with the youth through twitter and Facebook. Every retailer in order to survive has come up with a brick and mortar store as well as virtual stores. Smart consumers have to be dealt with smart marketing strategies. Event marketing is gaining footage. Customer relationship marketing has reached new levels. The key to the business has changed from need based marketing to partnership marketing, where customers are treated as partners. Innovative marketing is the new buzz word. Getting to know the ever changing consumer behaviour has become a challenge for marketers. Thus market research both qualitative and quantitative has gained much importance in today’s scenario. Marketing activities of a company must be dynamic to suit the market conditions. Those companies which take longer to adapt their marketing strategies to the new market scenario find themselves out of sync. Many examples can be cited although the most popular one being NOKIA. Thus the new marketing goes beyond the four p’s or seven p’s of marketing. Rather it is a 360-degree approach to knowing the customer and serving him best. The world of web has witnessed colossal changes in the past decade. Web usage has seen a tremendous variation, from a mere browsing platform to a central hub of social interactions. Emails, blogs, and social networks form an indispensable part of daily life of an average individual, with social networking topping the list. The advent of Web 2.0 applications has made social networking the de-facto standard of communication among internet users across all age groups, worldwide. Usage of these social networking sites varies from online shopping (ex www.flipcart.com,ebay), online knowledge base (ex-Wikipedia), business profiles (LinkedIn), online journalism (blogs) to social interaction with friends, family and professional colleagues online. Every day, 41% of Facebook users and 27% of Twitter users log on to their pages, four out of ten doing so before they get dressed or have breakfast [2, 3]. Influence of these sites on human minds is statistically visible, 9 percent of digital news consumers follow the recommendations from Twitter and Face Book . With the advent of social network it has become very popular trend for people to share what they are doing and what they are feeling regarding certain topics across various social network platform. Now a days we have vast amount of description, comments and rating for various services. This information is valuable as it provides individual spontaneous emotional realities. A network is defined as an object composed of entities interacting each other through some connections.Many systems represented in the form of networks, with sets of nodes or vertices connected together in pairs by links or edges. A natural mean, to mathematically represent a network is through a graph model. Social Networking has altered the level and style of societal bonding. It has affected the way we connect, share and build relationships with people and communities around the globe. Analyzing the current trends, it is obvious that the years to come will witness major changes in terms of connectivity, as the social web continues to evolve and adapt to our habits and technology. This dynamic scenario drives the research community towards development of innovative techniques to provide an enhanced amiable and hassle free social interactive environment. Efforts in this direction are already visible. Social sites are primarily a major source of information exchange both personal and professional. The presence of SNS is being felt in every other sector for various activities example-: e-commerce, e-banking, e-learning, healthcare and travel. The technological empowerment of the communication in Social Network has become vital for deriving optimum benefits from emerging change of communication. The popularity of these sites provides a unique opportunity to study the characteristics and dynamics of social networks at large scale. Hendler, J. and Goldbeck, J., 2008, Metcalfe's law, web 2.0 and the Semantic Web. J. Web Sem. 6(1):14-20. Digital Surgeons, 2010. Social demographics 2010: A fresh look at Facebook and Twitter. Message posted: http://www.digitalsurgeons.com/blog/design/social demographics-2010-a-fresh-look-at-facebookand- twitter. Integer/iModerate, 2011, Social Networking and Brand Engagement Research. PEW Research center’s project for excellence in journalism 2012 state of the news media. In simple words, it is the concept of fundamentally connecting any device with an on and off switch to the Internet (and/or to each other). It includes any household electronic device from cellphones to coffee makers, from washing machines to headphones, from lamps to wearable devices and anyother device you can think of. It can also include the industrial components of machinesi.e. jet engine of an airplane or the drill of an oil rig etc. In general we can say that if it has an on and off switch then hopefully it can be a part of the IoT. The analyst company Gartner forecasts that by 2020 there will be over 26 billion connected devices… From the estimate of some others this number can be even much higher, over 100 billion. It can be treated as a giant network of connected “things” including people. The connectivitymay be between people-people, people-things, and things-things. IoT might revolutionize your way of living. In future it may become the rule that, “Anything which can be connected, will be connected.” Try to visualize your future life. For example you are going for a meeting and your car has the access ofyour calendar and guides you to take the best route. If you are stuck in traffic then your car might send a text to the other party notifying them that you will be late. Your alarm clock not only wakes up you at 6 a.m. but also notifies your coffee maker to start brewing coffee for you. What if your office equipment knew when it was running low on supplies and automatically re-ordered more? How will it feel if the wearable device you used in the workplace could tell you when and where you had been most active and productive and shared this information with other devices that you used while working? Recently lots of work is being done to find “How ‘IoT’ can be applied to things like transportation networks: “Smart Cities” to help us reduce waste and improve efficiency for things such as energy use” etc.Also to understand and improve how we work and live. Actually, the IoT allows for virtually limitless opportunities and connections to take place, many of which we may not even think or imagine or fully understand the impact, today. The biggest challenge for IoT is security .It opens up companies all over the world to more security threats.As billions of devices are connected together, all these devices and systems collect a lot of personal data about people e.g. the smart camera knows when you’re home and what electronics you use when you’re there. This information is then shared with other devices and held in databases by companies.There is a possibility that someone is able to hack into your toaster and thereby get access to your entire network. Then we have the issue of privacy and data sharing. Since it is upcoming field, so presently we can only imagine how the conversation and concerns will escalate when billions of devices will be connected. Another issue that many companies specifically are going to face with IoTis around the massive amounts of data that all of these devices are going to produce. It will be a big challenge for companies to figure out a way to store, track, analyze and make sense of the vast amounts of data which will be generated. Presently, IoT is being used by big companies like Intel, Microsoft, Cisco, Apple, and Google etc. Globally, new areas are being explored where IoT may bring revolution and change the way we think, live or work. People are trying to understand the opportunities and challenges which may arise as more and more devices start to join the IoT. For now the best thing that we can do is educate ourselves about what the IoT is and the potential impacts that can be seen on how we work and live.